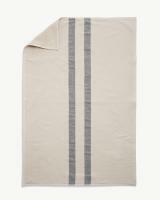 Stripes towels are woven from 100% organic cotton with a soft and absorbent terrycloth on the one side. On the other side, you find a simple but timeless woven pattern which plays with the scale and look of the classical Breton stripes. That way, the Stripes series brings elements from the world of fashion into the kitchen and bathroom in a new and balanced way.